So what is coralline, why would you want it, and how do you get it? Despite the name, coralline is a group of red macroalgae, and are not animals or related to coral in any way. They are heavily calcified, ("crutose" in fact), and grow slowly relative to other algae species. They are most common in shades of red being that they are red algae, but like regular red macroalgae coralline can come in different colors;. Many blends of yellow, green, red and bluevare possible because of the pigments contained in coralline species. (The major pigments are chlorophyll, phycoerythrin, and phycocyanin). People generally want coralline species in their tank because it looks nice, and it takes up real estate that other nuisance algae might take up. 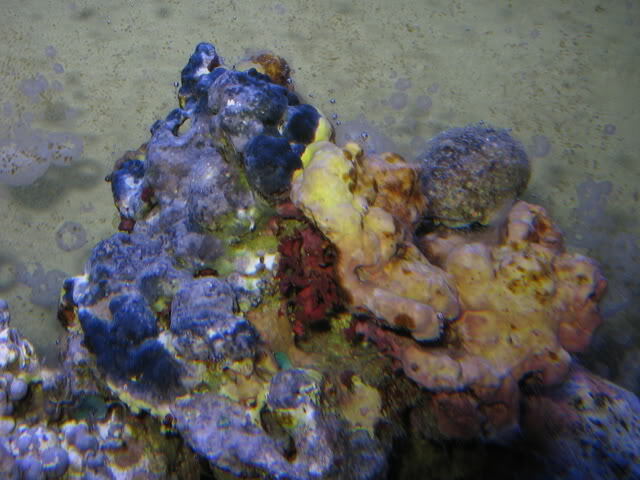 Epiphytes, algae that can grow on other algae, (in this case), are usually nuisances and can grow on coralline, but coralline has chemical defenses to help slow this process. Most coralline species are themselves epiphytes, but are not considered nuisances. Coralline spreads via asexual and sexual reproduction. Because of this, you can grow it by placing some on a rock next to another rock and then it may "spread" to that rock, you can cut it or scrape it and place it on a rock and have it grow onto that rock, or simply keeping it in your tank will allow it to spread through out the tank via spores it sends out that eventually settle in your tank. To speed up the process of colonization some people will rub a rock with a desirable coralline species onto bare rock, causing the coralline to scrape off onto the new rock leaving a mark. Coralline can grow on almost every hard surface found in the aquarium, it collects the nutrients it needs from the water column, and is therefore not limited to colonizing only calcified surfaces like rock like you may have heard. In order to keep it alive, you should keep parameters within acceptable reef aquarium ranges, a table of which can be found here. Even though coralline is an algae, it tends to grow poorly in high nutrient water. Studies have shown that high nutrient levels inhibit coralline growth, but it is unclear if that is because the algae is under attack from nuisance algae epiphytes that thrive under those conditions, or because high nutrient levels interfere with the calcium carbonate building process. Some people try to "jack up their calcium and alkalinity" in an effort to grow coralline more quickly. While it is true coralline can be limited by a lack of calcium, as long as calcium levels are within acceptable levels, it is unnecassary to raise them any higher for good coralline growth. For best results with coralline, keep the tank clean so it has room to settle, make sure parameters are within acceptable ranges. Fast changes are likely to cause more problems than results. 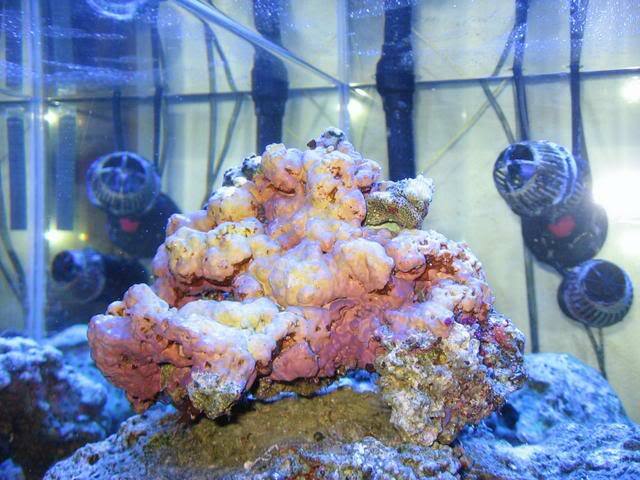 With regards to lighting, most species of coralline prevalent in the hobby will prefer bright lighting. However, there are many interesting forms of coralline that only grow in the shade. If a particular specimen you like is not performing they way you want it too, (losing color, turning white), try placing it under a shaded area. Many species of coralline will grow under rock overhangs, only receiving the light that is reflected from the sand below. Others, like the branching specimen pictured at the bottom of this page are found at the base of thick seagrass beds that shade almost all the light from the surface. Coralline is a food for certain herbivores like urchins, parrotfish and certain species of chitons and limpets, although not the chiton and limpet species we carry. If keeping coralline is a particularly important goal of yours, you will want to stay away from these species or at least keep in mind their potential impact on the algae. Coralline comes in many shades and colors, and one of the fastest growing encrusting coralline species likely to be encountered in aquaria are green in color and may make you think you have a type of nuisance algae growing on your rocks. You can distinguish green coralline algae from film algae by testing its hardness, coralline should not come off easily when toothbrushed. Fast growing green coralline algae usually takes up residence on bare rock, and is often later engulfed by epiphytic coralline algae that have "better coloring" like reds, pinks and purples. 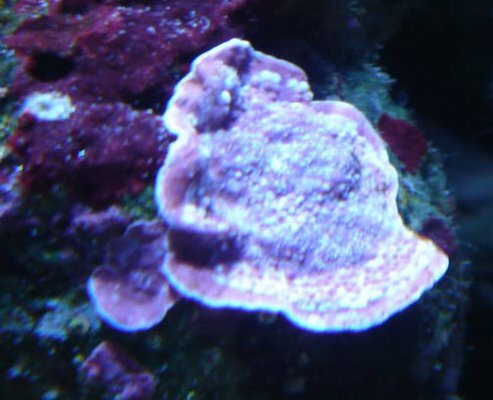 When selecting a species of coralline you like and want to spread throughout the aquarium it is important to notice the growth rate of the coralline. Generally speaking, fast growing coralline species are encrusting, rather than plating or branching species. 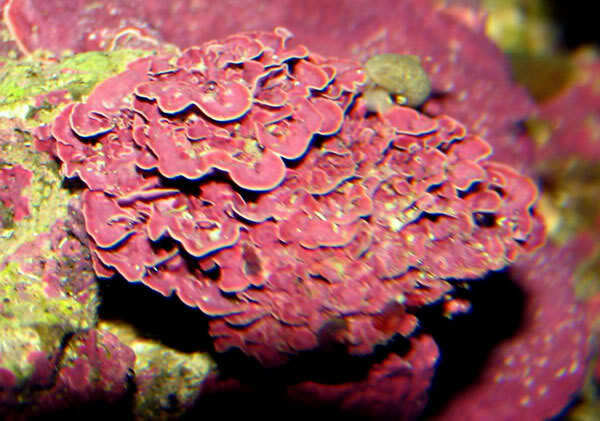 Even though your aquarium will likely be covered in encrusting coralline before branching and plating forms show significant growth, the good news is that branching and plating types of coralline are better at resisting epiphytes than encrusting forms, and are unlikely to be choked by the encrusting coralline that will otherwise dominate the aquarium. So even if everything in the tank is now covered in encrusting coralline, you can still add plating and branching forms that will grow over encrusting algae, and are at low risk of succumbing to the encrusting coralline. Thanks to the finalists of our liverock specimen contest that submitted these images. Stay tuned for our next article, "How do I get all this coralline off of my glass I can't see my tank".